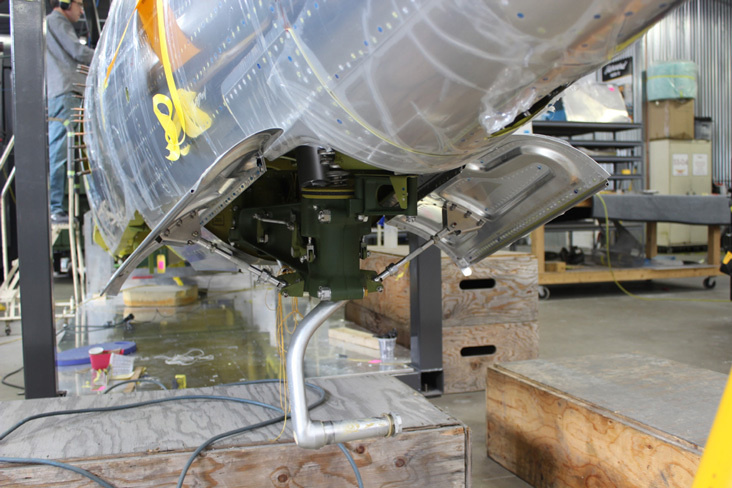 The tail wheel assembly is installed permanently. 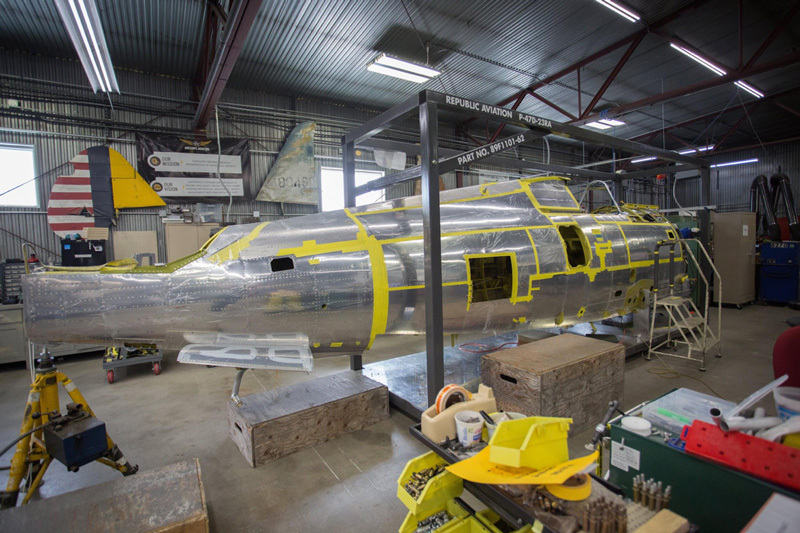 This month the restoration milestones include the tail wheel installation and the assembly of the firewall extension. 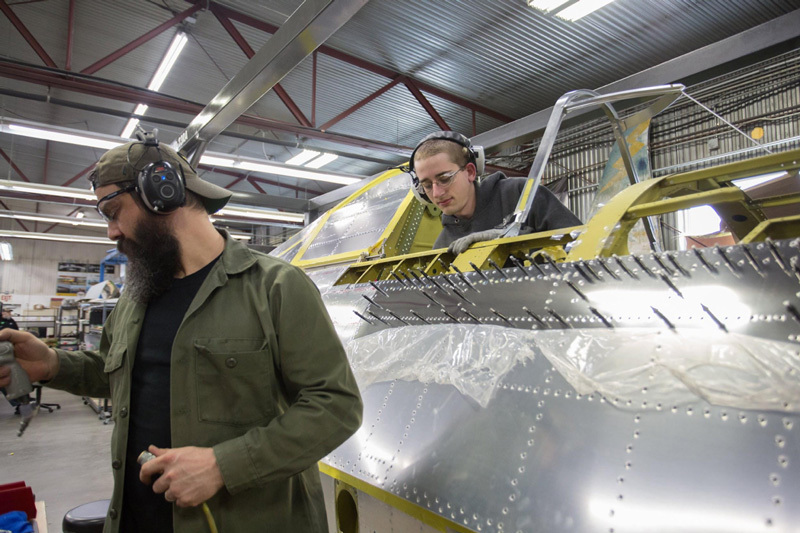 We’ll check those out and incorporate the last installment of P-47 history. The Thunderbolt’s tail wheel had to be strong and reliable to ensure safe take offs and landings at weights as high as 17,000 pounds for the D-23 and as much as 21,000 in later N models. The tail wheellocks straight ahead after taxi and is released from the locked position after landing to be able to turn as The P-47 taxies. 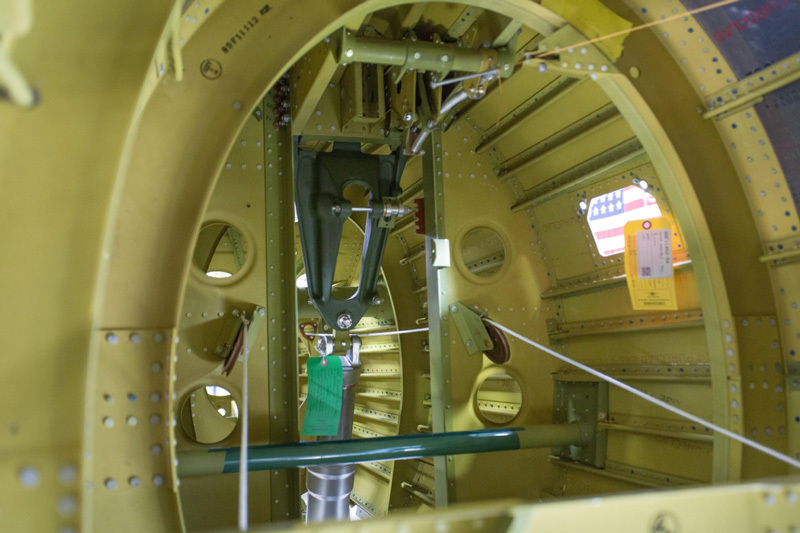 The lighter green horizontal cylinder is the tail wheel centering unit. 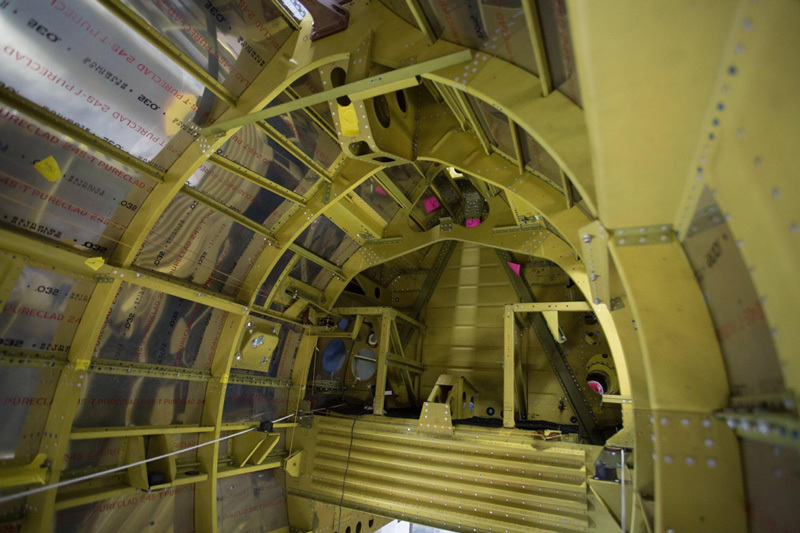 In the center of the image, the stacked yellow and black disks are the tail wheel anti-shimmy disks. The linkage with the “L” shaped bellcrank is the tail wheel anti-shimmy lock. 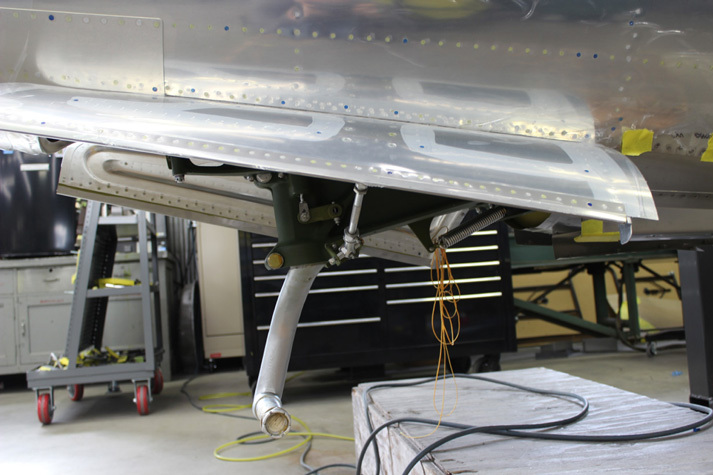 The tail wheel strut shows here, also visible are the tail wheel centering arm, and linkage to the centering unit. 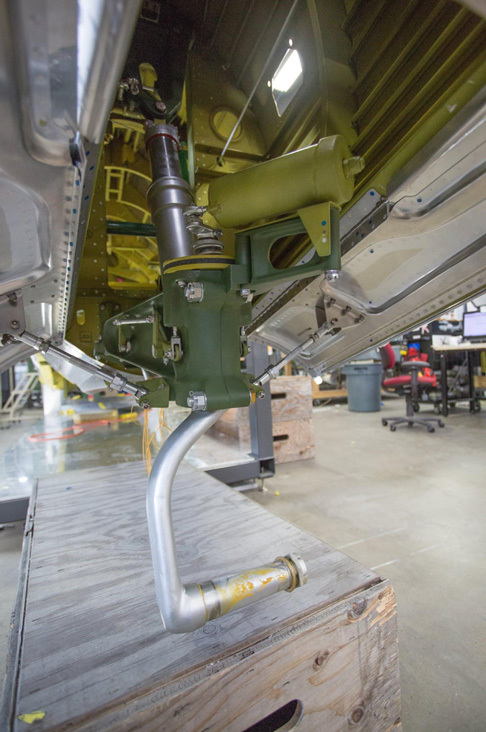 The upper tail wheel strut connects to the drag brace. 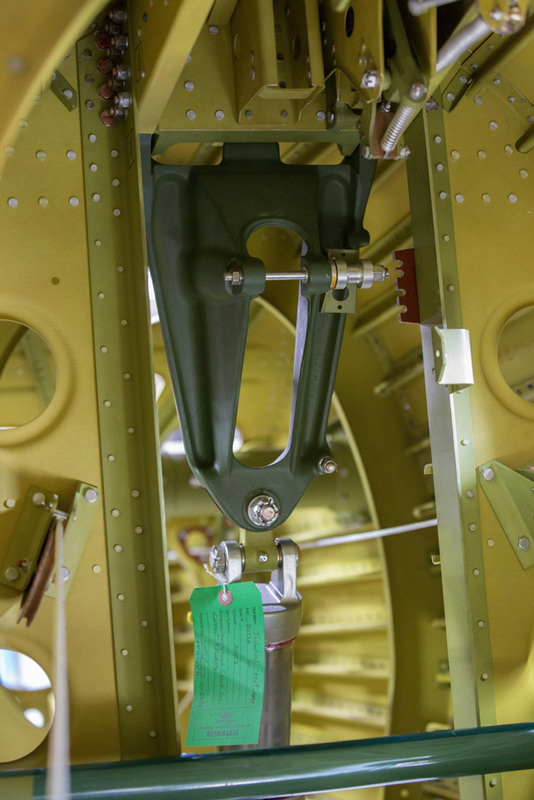 The tail wheel door links connect the tail wheel forging to the doors and pull the doors closed during tail wheel retraction. 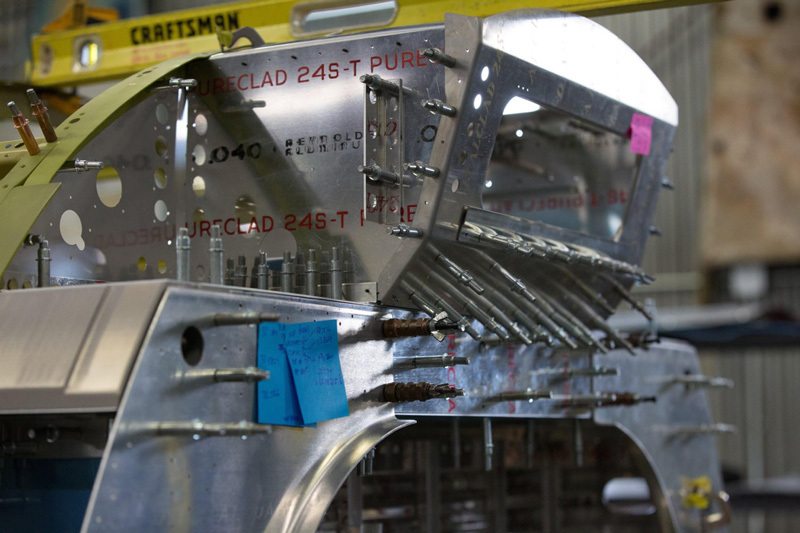 The right side tail wheel door link is also visible in this side view. 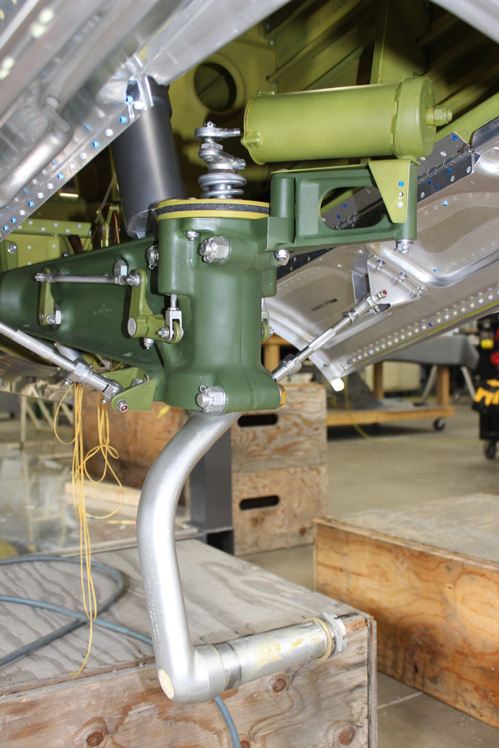 The darker green casting is called the tail wheel drag brace and pivots up as the tail wheel is retracted. 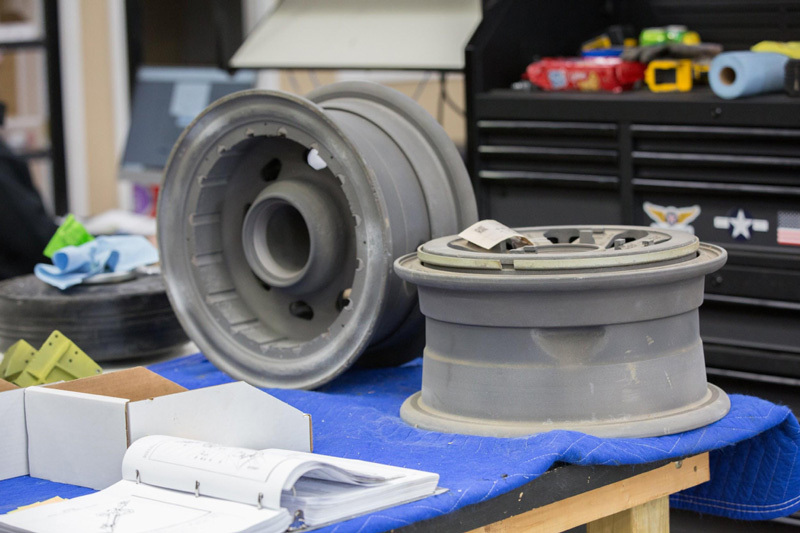 Two main gear wheels await inspection on Lance’s bench. 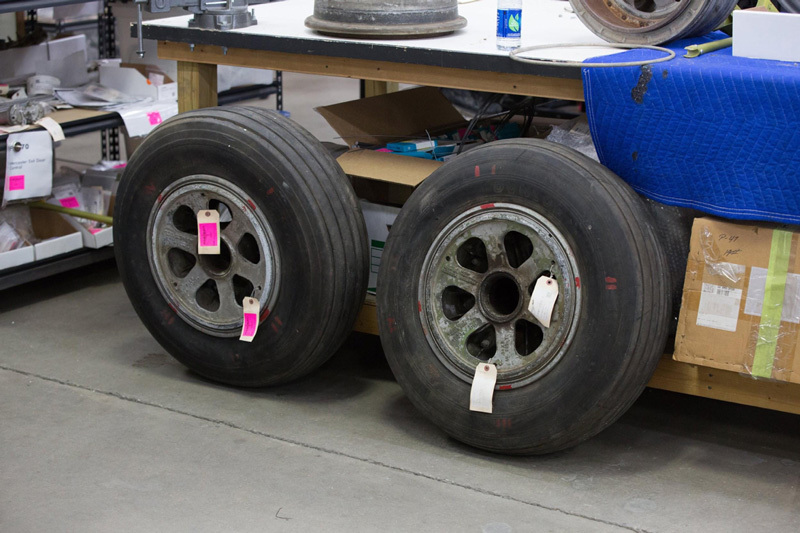 Another set of main gear wheels with tires awaits inspection. The corrugated bulkhead is the rear of the auxiliary tank, just above we can see the darker green triangular rollover structure. 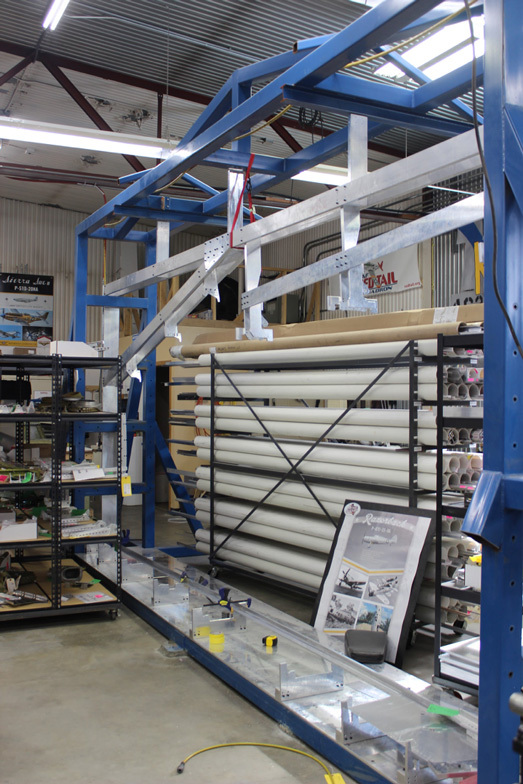 The vertically oriented pulley we see from the edge on, is part of the tail wheel centering lock cable linkage. At the moment, string is tracing the eventual cable’s path. 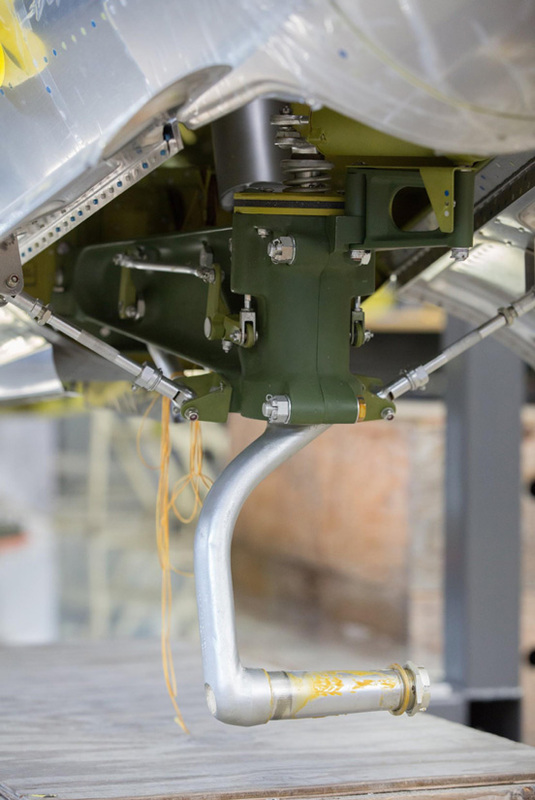 Also visible is the heavier rudder cable. 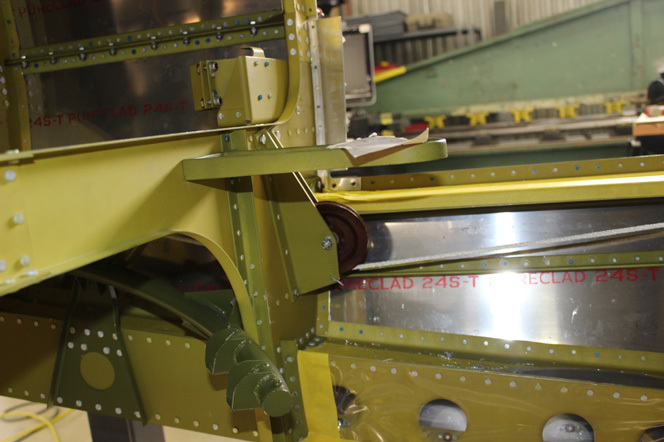 This view shows the fuselage interior forward of the upper end of tailwheel strut. The yellow string at the top of the image traces the path the cable will follow to the uplock mechanism. 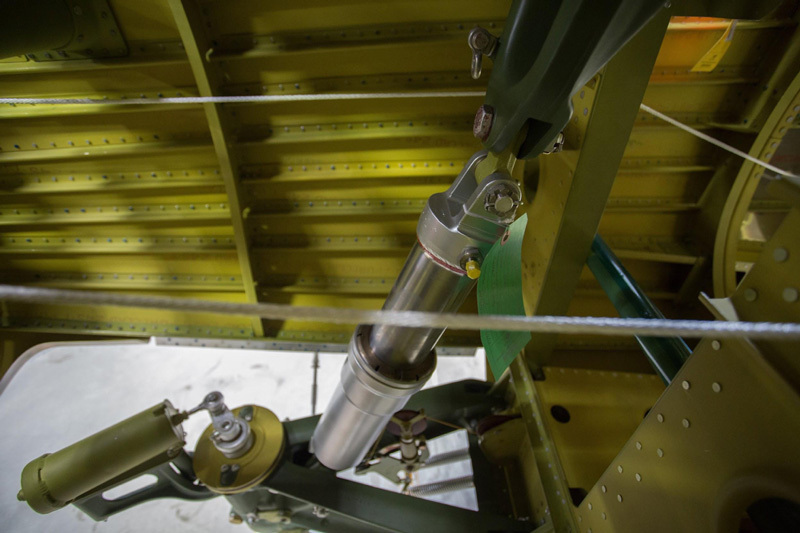 The heavy steel cables are the rudder control cables as they extend back toward the rudder. 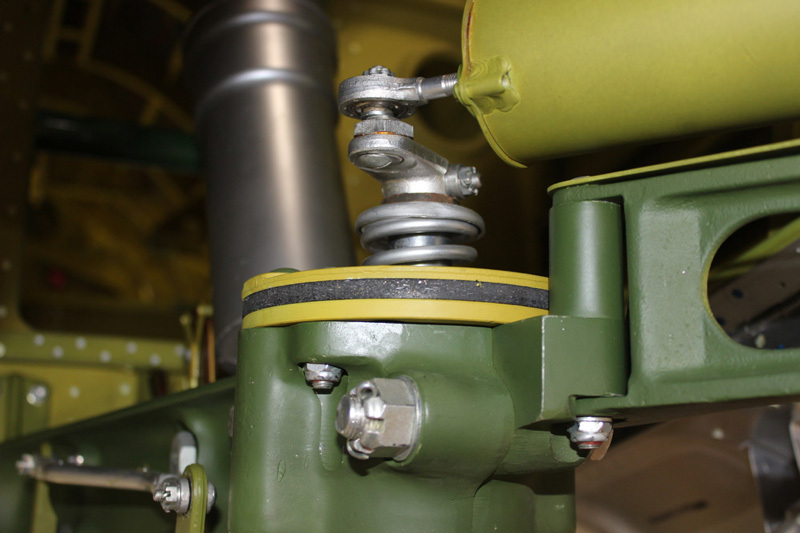 The rudder cable runs through a pulley just above where the turbocharger will be installed. 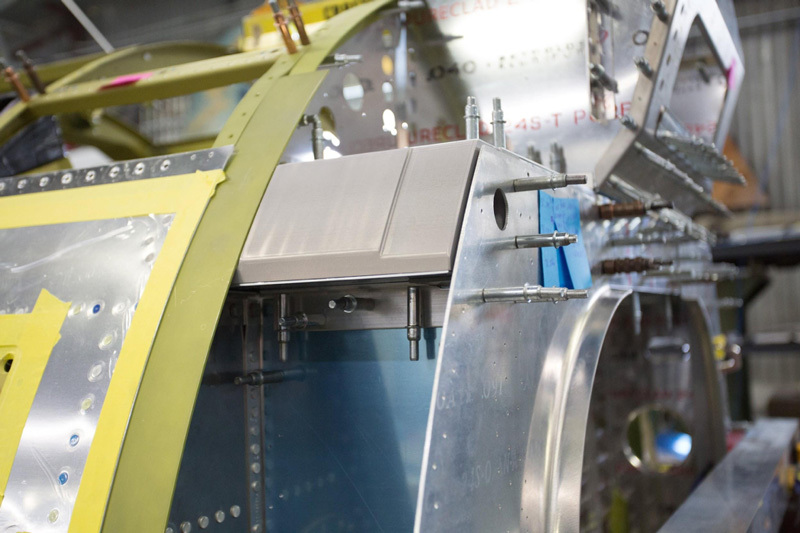 As a location reference, the opening in the side of the fuselage is for the left side intercooler exit door. 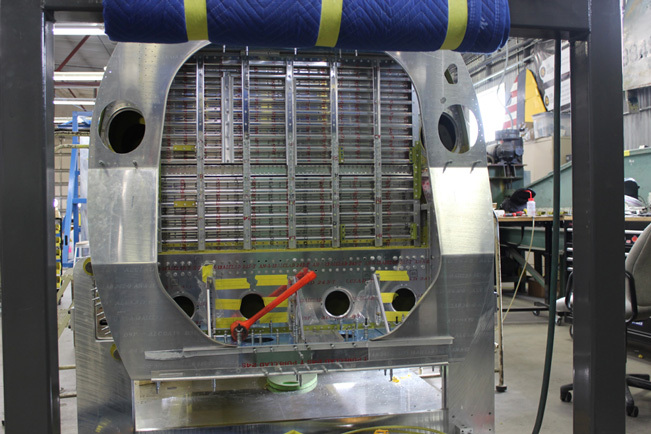 This is the firewall extension assembly as it is being fabricated. 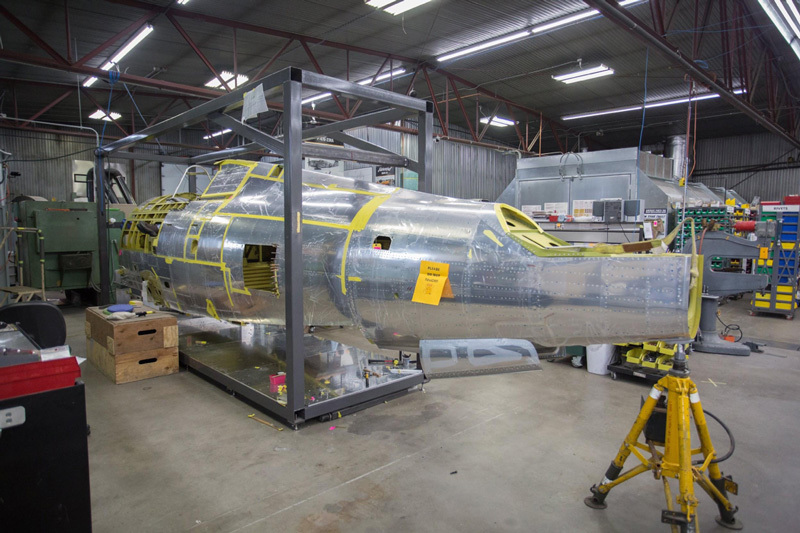 The first Thunderbolt to use a firewall extension was 41-6124, the earliest P-47C-1-RE. The actual machined extensions move the engine mount forward by 8 inches. 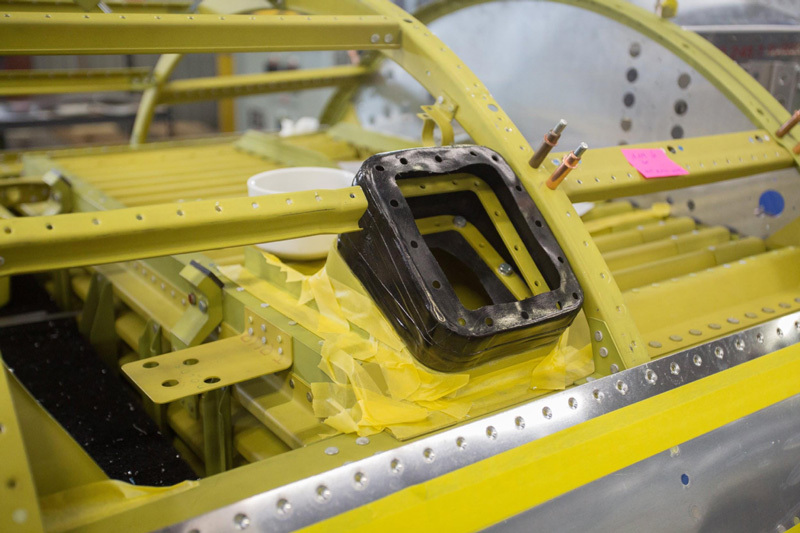 The machined upper right side engine mount extension is one of four of the main load carrying components of the firewall extension assembly. This is the lower right fitting assembly, engine mount extension-lower. The extension assembly from the front. 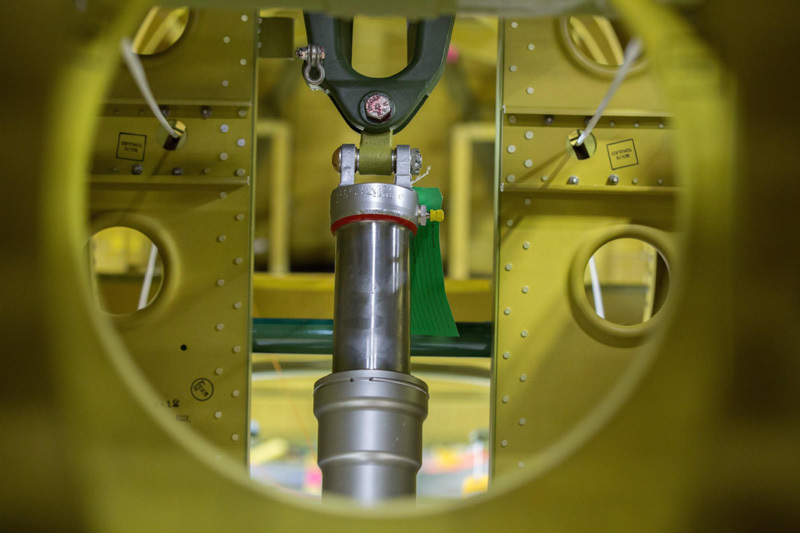 The purpose of the extension was to improve handling through a change in center of gravity, and also to provide more room in the engine accessories section. The structure on the top of the firewall extension assembly is the dynamotor support. The dynamotor converted the 24 volts available in the generator/battery circuits into the much higher voltage required to power the tube radios in use during WWII. This is the main tank fuel fill opening. Ryan works at making certain the cockpit enclosure slides freely. 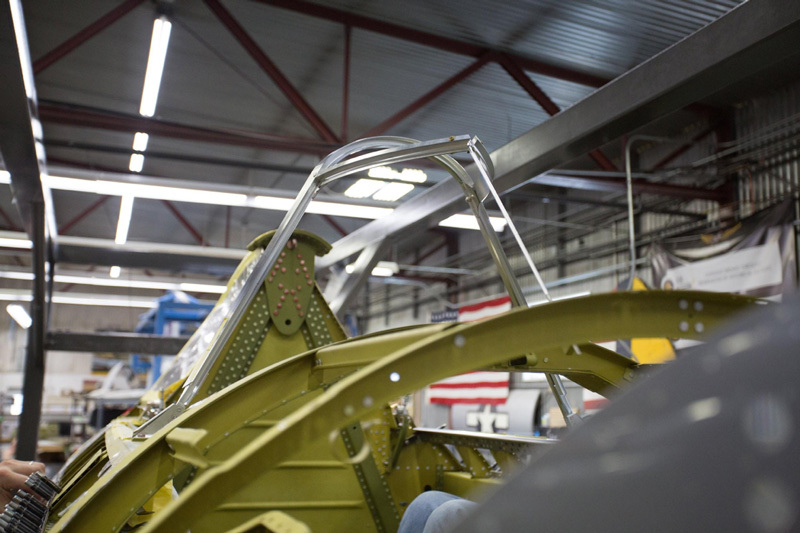 The windshield frame is distinctively a Razorback assembly. 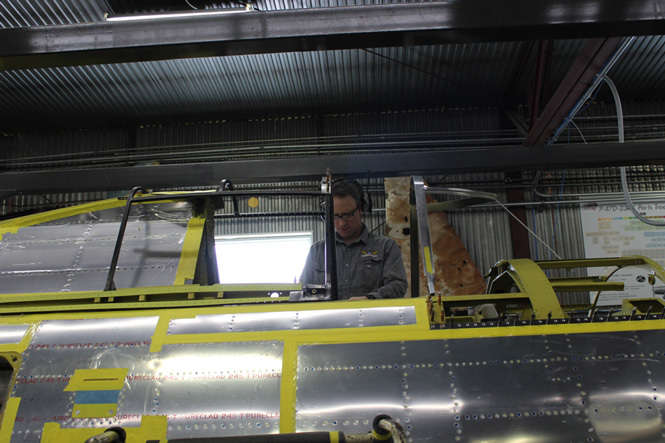 Aaron waits in the cockpit as Randy connects his rivet gun to the air hose. 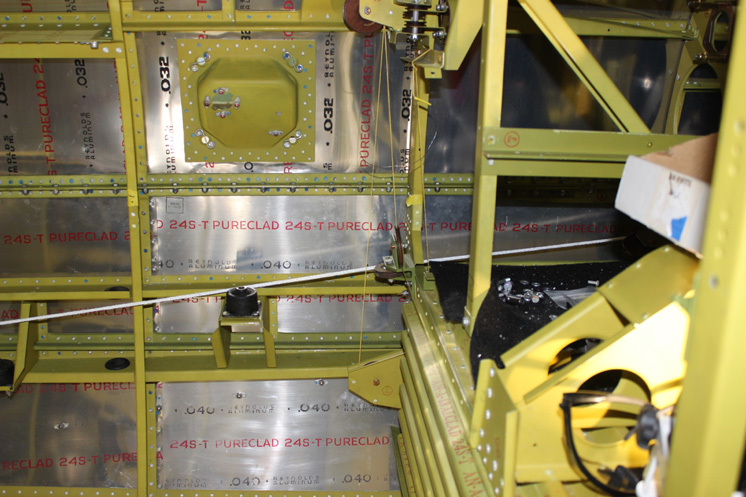 This quartering angle shows us how much of the left side fuselage skin is riveted on permanently. 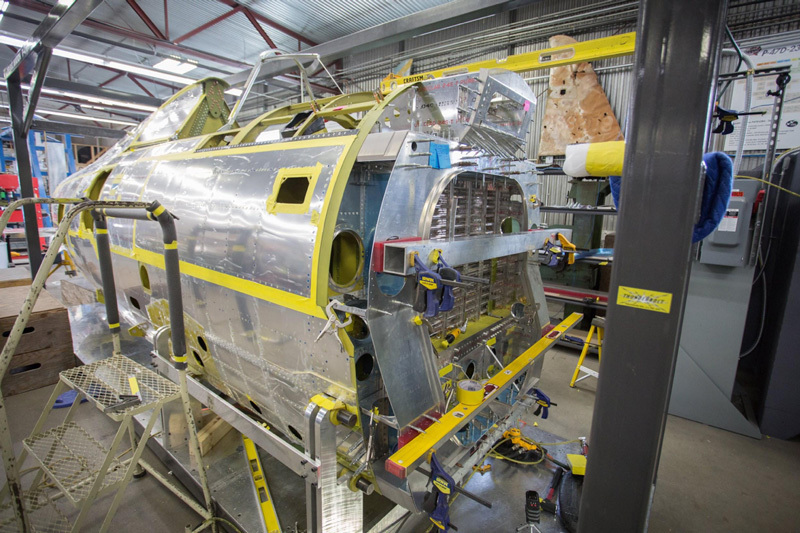 Even more of the skin riveting is completed on the right side of the fuselage. 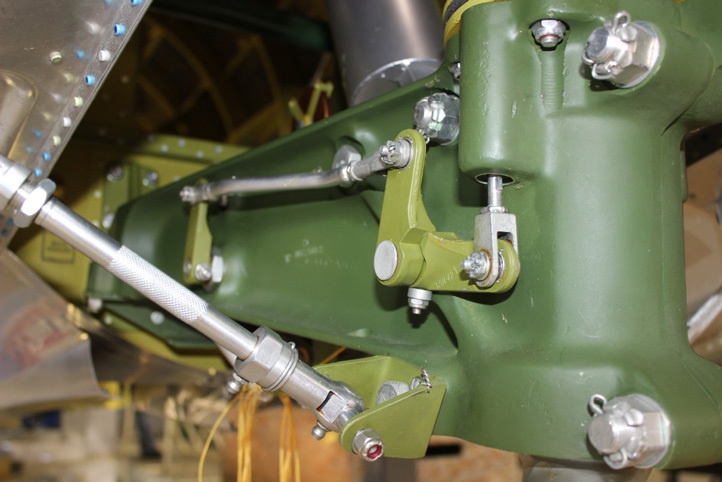 The fixture attachment points have been fabricated to fit the D-23 wing. 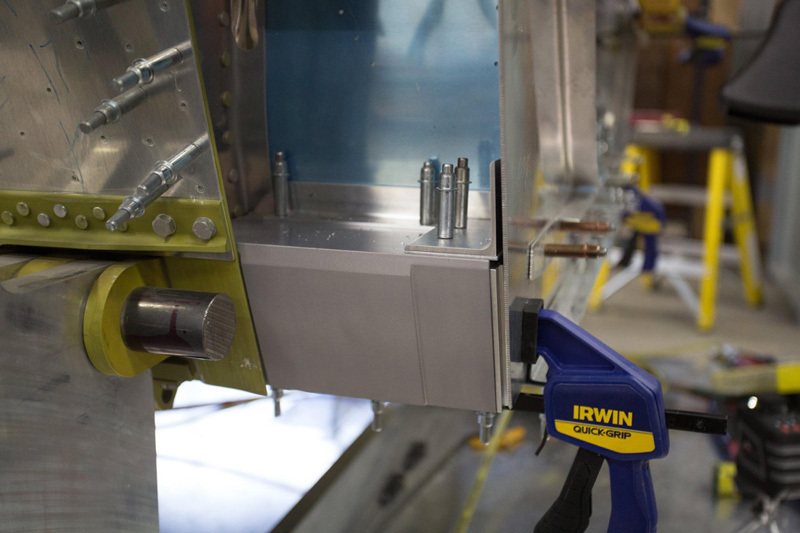 Completing the attachments on this jig will bring us one step closer to beginning assembly work on the wings. The Thunderbolt is justifiably famous for ground attack missions in the European Theater of Operation. But the P-47s ground pounding history didn’t begin in Europe. While close air support of ground forces dates back to World War I, the air to ground communication of the time was very primitive, which limited effectiveness. The fighter-bombers of the Allied and Axis powers in the Second World War were far more effective. 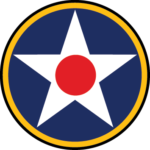 For the USAAF in World War Two, close air support of ground troops was pioneered in New Guinea during the summer of 1942. Long an advocate for ground attack, Fifth Air Force commander Major General George C. Kenney had taught a class titled “Attack Aviation Course” in 1937, and wrote the textbook for it. Kenney turned theory into practice when 5th Air Force A-20 Havoc light bombers strafed Japanese positions in support of Australian troops. The A-20s had been modified by Major Paul “Pappy” Gunn by adding four .50 caliber nose mounted guns that he salvaged from wrecked fighters. General Kenney ordered his fighter groups to develop ground attack tactics after seeing the success of the A-20s. Early 5th AF ground support missions were carried out with P39s, P-400s ( export version of the P-39) and P-40s. When the formidably armed 8 gun P-47s arrived in the Southwest Pacific Theater in late 1943, they naturally were used in the ground support role as well as the air to air combat missions. Close air support missions continued during Operation Torch in North Africa. In November 1942, Twelfth Air Force Commander, General James Doolittle, like Kenney, assigned the initial close air support role to A-20s. Later fighters carried out ground support missions, mainly P-40s and P-38s. RAF pilots who had been flying CAS missions and developing tactics since 1941, shared their tactics, and provided some training in close air support to the Americans. As the war progressed, the Twelfth Air Force moved on to Italy and Thunderbolts were used for ground attack extensively in that campaign. 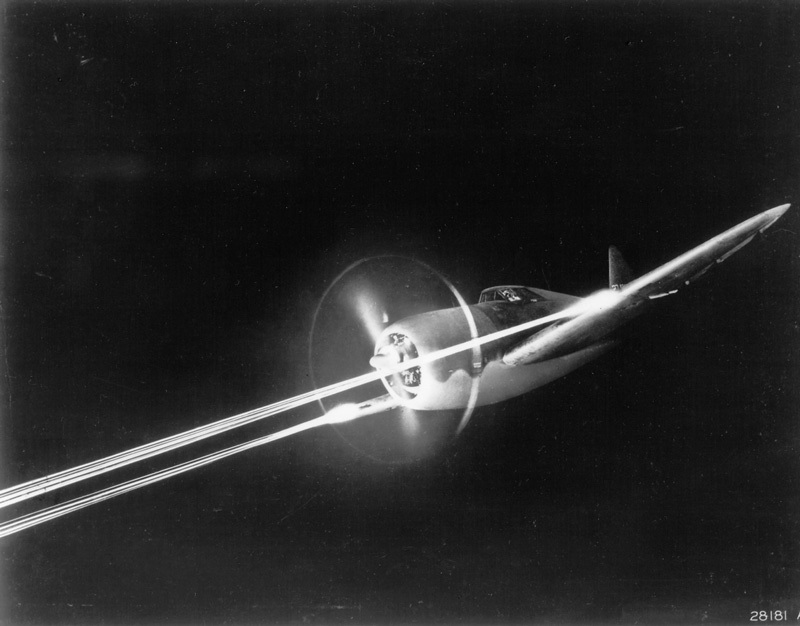 The effectiveness of the Thunderbolt’s eight .50 caliber Brownings, and its ability to carry a significant bomb load on the dangerous ground support missions in Papua New Guinea, made it a natural to be tasked with close support of the Normandy invasion and the subsequent march across France into Germany. The fighter-bomber or Jabo (short for the German jagdbomber) role of the P-47 is best known from the European Theater’s extremely effective and very dangerous ground attack missions after the invasion. While various sources list slightly different totals, Thunderbolts have been credited with the destruction of an estimated 6,000 tanks and armored vehicles, 9,000 locomotives, 86,000 railroad cars and other rolling stock, and 68,000 trucks during the war.1 The number of troops killed and wounded by the P-47 in the fighter-bomber role will never be known accurately. Besides the USAAF, P-47’s were sold or supplied to Brazil, Free France, Mexico, the UK, and the USSR during WWII. Fifteen foreign countries and a few USAF reserve units flew the P-47 after the war.